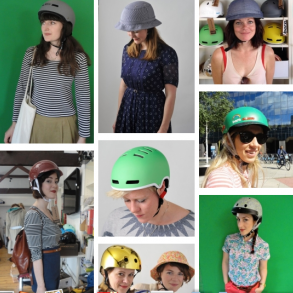 London Cycle Chic: Hot in a Helmet: We Need You! Hot in a Helmet: We Need You! Readers of the blog will know we are on a mission this summer to rid the 'Bike Helmet' of its geeky image and champion it as a Fashion Accessory not a Fashion Crime. Its not that we think everyone should ALWAYS wear a helmet when cycling. Wearing a helmet is a choice and I am all for the freedom of flowing locks. However when I first started cycling in London I was scared of the roads and a combination of wearing a helmet and having professional cycle training gave me a much needed confidence boost. So to help women get over their helmet hang ups we have launched a Hot in a Helmet Gallery and we need pics of you 'rockin' it in your helmet. Or just have a browse at the gallery and like your fave looks. I met a cyclist the other week with a lovely low profile helmet. A Met camaleonte urban helmet - geared at suity types in cities. I looked it up on their website, but they only do it in medium and large, which is not very good for ladies with small heads - anyone know of a small sized helmet similar to this? It's about time nicer helmets were made. We are in Time Out today, Hurrah!